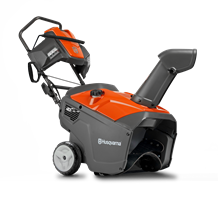 Husqvarna’s two-stage system snow throwers work well even with hard-packed snow by grinding it down before it is fed into the housing and discharged through the impeller. 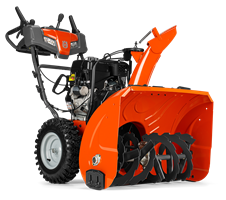 Our snow blowers are built to withstand the demands of harsh winters with heavy-duty, two-stage components featuring a cast iron gearbox and impeller, each with a 10-Year Limited Warranty for years of trouble-free snow removal. 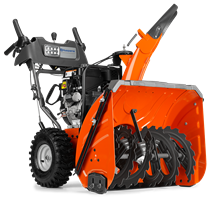 Husqvarna snow blowers offer a cleated track-drive system that delivers unbeatable propulsion on slippery surfaces, hills, and deep snow. 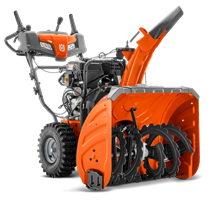 Convenient trigger control power steering allows you to operate each wheel/track separately for superior maneuverability and tight 180-degree turning. All levers and controls are placed within easy reach for added comfort and control. 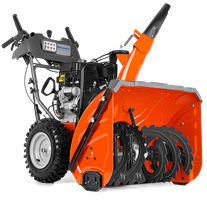 Heavy Duty Auger – Gives first-class results operating in frozen as well as in extremely wet snow. Electric Start – Connect to a power outlet and start the engine by pressing a button. Our starter system ensures that you’ll never have to worry about a dead battery. Heated Handle Grips – For a more comfortable operation in a cold climate. Remote Chute Deflector – Control the vertical throwing direction with a lever on the panel. Compact design for easy operation and convenient storage and transportation. 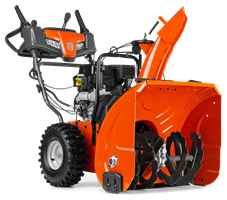 Specs: 21 inches wide with a Single-Stage blower. Very effective snow throwers with a high throwing capacity. 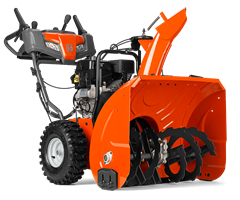 Specs: 24-30 inches wide with a Two-Stage blower. Perfect for frequent use in all snow conditions in large areas. Robust, durable and comfortable to use. 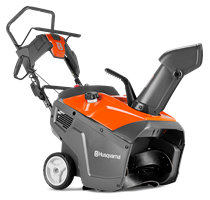 Specs: 24-30 inches wide with Two-Stage blowers and a high capacity belt system. 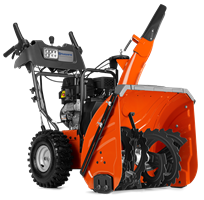 Compare models and learn more about Husqvarna Snow Blowers online.